The perfect custom gate for a cattle drive on the open range. 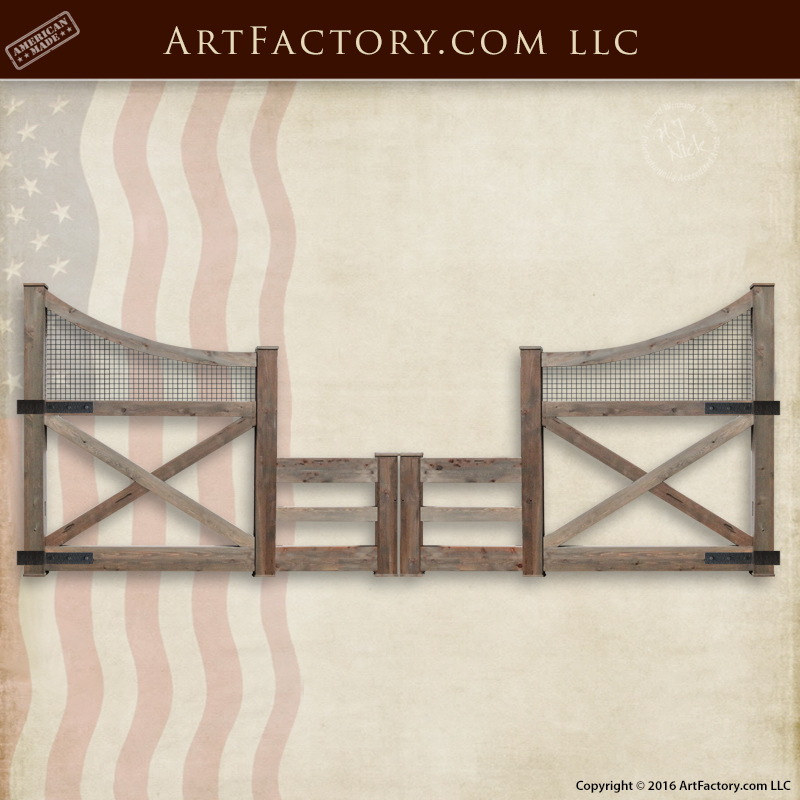 Our custom ranch fence gate is handcrafted in the USA by master craftsmen, and built to stand the test of time. This custom gate for a ranch fence is built from solid, full length, American timber. Additionally, it includes hand forged wrought iron hardware (including heavy duty gate hinges and basketweave style iron mesh. We built custom ranch gates in any shape, size or style of your choosing. This custom ranch fence gate (as pictured) is 25 feet wide to allow for easy access for trucks and tractors. Furthermore, it stands 10 feet tall with solid, 9 inch thick construction, and sturdy, hand forged iron mesh to ensure that your livestock stays on the right side of the fence. Order in any size. 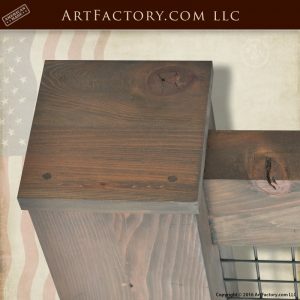 There is no custom gate project too large or too small, at ArtFactory.com the sky is the limit! The custom ranch fence gate, like all of our wooden gates, is built from solid, naturally air dried wood. It is handmade with mortise and tenon joinery for construction that is made to last. In conclusion, it has been finished to world class, fine art specifications using a multi-step, hand rubbed process that blends the finish into the grain of the wood. All of our wood products are finished using this intricate process, and certified with the seal of world renowned artist and designer H.J. Nick. To top it all off, all of our door and gate products include custom, blacksmith hand forged, wrought iron hardware. This means hardware that is hand hammered over a coal fired forge by classically trained blacksmiths. Our blacksmiths use only pure, solid wrought iron, and old world techniques to construct high quality hardware that is virtually maintenance free and will never need replacing. In addition, all wrought iron hardware products are advance patinated with a hand applied, heat infused iron oxide finish. This means that your hardware will never rust or corrode and will only look better as time goes on. Call 1-800-292-0008 to get your custom quote today.